We have been providing hunters and shooters with reliable chemicals for more than 75 years. Check out our full line of impressive cleaners and degreasers, as well as lubricants and protectants. 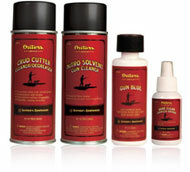 You won't find a more proven, economical and trusted gun-care chemical line anywhere else. Looking for a cleaning kit for a specific firearm? See Usage Chart to find a perfect match. Our reliable and field-proven solvents cut through lead, copper and plastic wad fouling to clean rifles, shotguns and handguns. Our dependable lubricants keep the moving parts on your firearms operating smoothly and protect them from the elements.